The idea for this sensory bin actually came to me as I was out grocery shopping. I was walking down the pasta aisle at a grocery outlet and came across some rigatoni noodles. In two sizes. 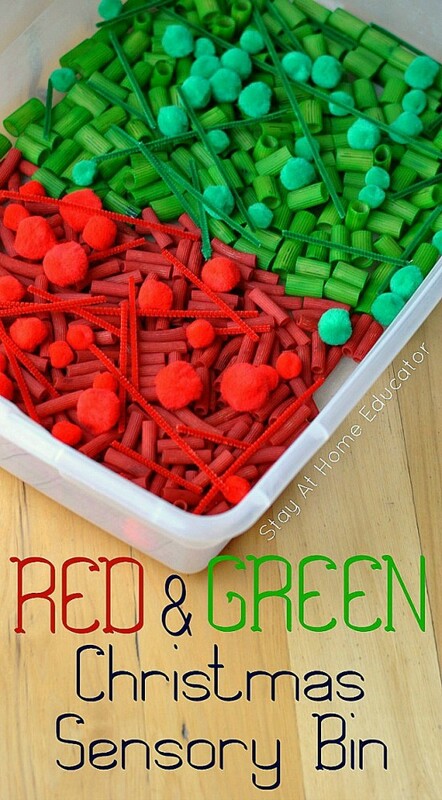 Two sizes that would when dyed red and green with a little bit of peppermint essential oil would make a lovely base for a Christmas sensory bin that would also teach some serious concepts in measurement. Christmastime is full of sensory stimulation. Think about the last time you walked into a coffee shop. Bells hanging on the door jingle as you open the door. Pine garland with white twinkling lights deck the counter top. Seasonal spices like clove and allspice float through the air from freshly baked pastries that are still warm from the oven. You patiently anticipate the warmth of the 16oz hot cocoa with eggnog whipped cream and a sprinkle of cinnamon. And you take a sip, loving every bit of it’s fatty, high calorie goodness. And you drink it without guilt because it is every bit as wonderful as you were hoping. I love a rich hot cocoa on a cold December day in the midst of a little bit of shopping. Christmastime awakens every one of your senses. 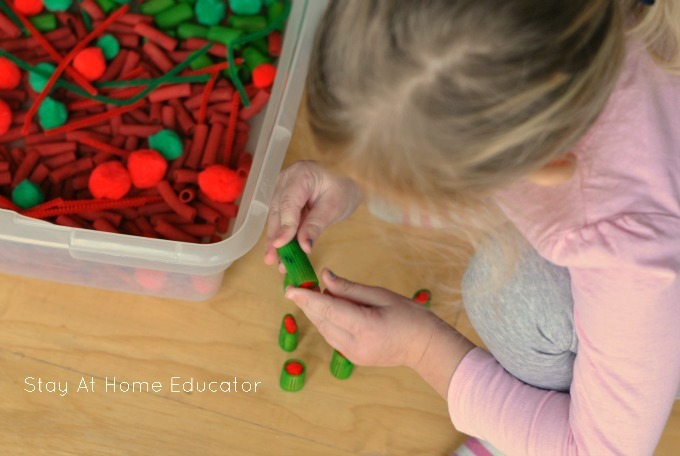 Christmas + Sensory = Math? The two sizes of rigatoni pasta happened to be just right for a sensory bin where I could create some opportunities to indirectly teach my preschoolers about measurement. The smaller noodles fit perfectly within the larger noodles. I added some red and green pipe cleaner cut in various lengths, as well as some pom poms of different sizes. The first thing the preschoolers did was to mix up the colors, of course. That’s ok, and should even be encouraged, because their play naturally led them to searching through the sensory bin for specific items, kind of like a kid searching through a bin of legos looking for that perfect piece. 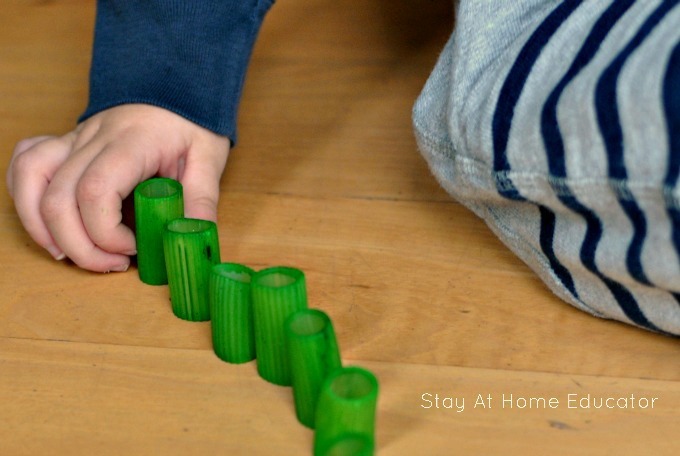 One preschooler gathered as many green noodles as he could and lined them up on the floor, placing them on end like dominoes. I love it when a sensory in has an unexpected fine motor element, and this Christmas sensory bin certainly was that. This preschooler was young for the class and it took a fair amount of concentration for him to make such a long line of pasta. My son, who was just two and a half at the time, tried filling the hollow pasta with the pom poms. He quickly discovered that not all the pom poms were the same size, as some of them could easily fit into the pasta while others had to be forced a bit. Some of the older preschoolers treated the Christmas sensory bin more like measur. 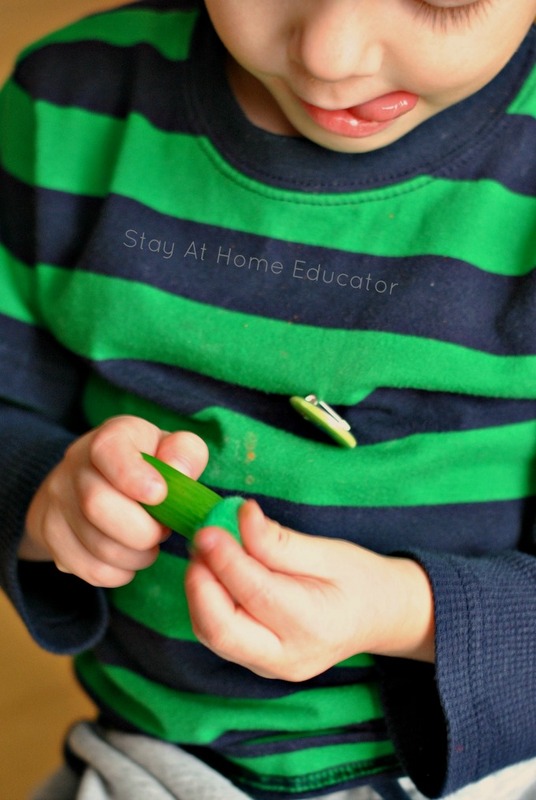 The preschooler below put red pom poms into the green noodles to make “dolls”. She made on for each member of our class, inadvertently practicing one to one correspondence skills, and kindly asked the students using the center that they leave her creations so everyone had a chance to play with their handmade doll. So, How Does This Teach Measurement? Well, let’s recap just how the way the preschoolers played in the Christmas sensory bin proves to be them practicing their math skills. The colors and sizes of the noodles got mixed up, so the children had to sort through the bin to find exactly what they were looking for. One preschooler selected a specific size to stack on end and line up. 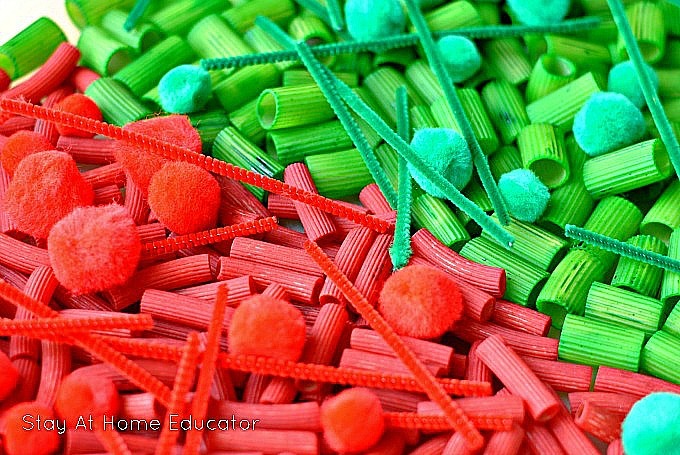 Another preschooler discovered that not all the pom poms would fit into any given noodle, but that he had to make comparisons to find the right size. Another preschooler had to sort through the bin to find both the right size noodle and the right size pom pom to make her dolls. That same preschooler also practiced one to one correspondence skills as she counted how many dolls she made and made sure that she created one for each preschooler in the class. 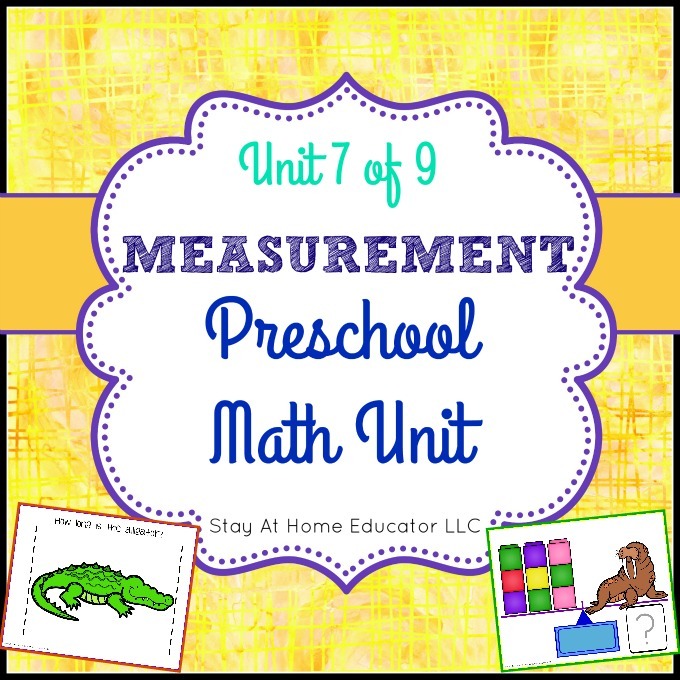 Looking for More Measurement Activities for Preschoolers? 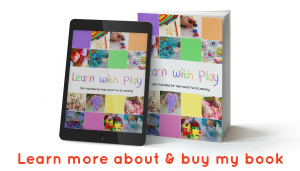 If you’re looking for other fun and creative ways to teach measurement to preschoolers, then you will love my measurement lesson plans! 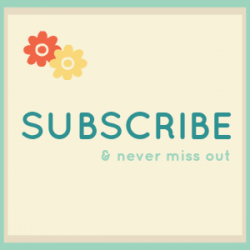 You can use them as traditional lesson plans, but they are also designed to allow you to pick and choose activities as well. 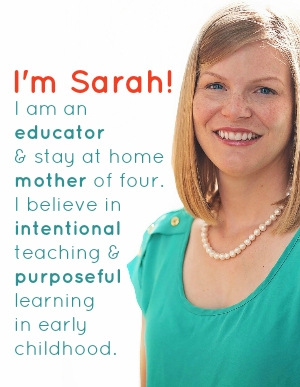 But, my favorite part is that they include eight pintable centers for your preschooler to practice skills independently. You can also purchase these from my Teacher’s Pay Teacher’s store.